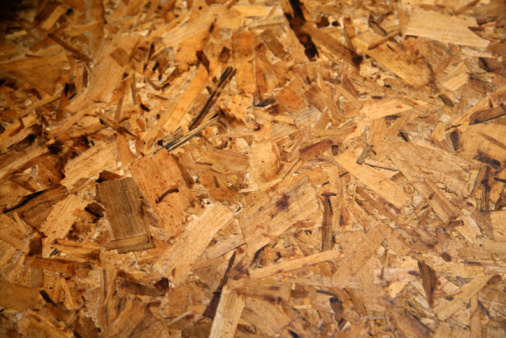 Wood and medium-density fiberboard are materials used to build cabinets. MDF is a manufactured product consisting of wood byproducts and resin glued together under hydraulic pressure and heat. The decision to use MDF or wood for cabinetry hinges on application, appearance, maintenance and cost. Health issues concerning MDF include formaldehyde, which is a gas emitted from adhesives used in the manufacturing process. Wood cabinets have no such issues unless they contain hardwood plywood or particleboard. Wood cabinets in a modern kitchen. Wood cabinets consist of wood pieces glued together. Wood shrinks and expands when humidity levels fluctuate. The constant movement of the wood can create cracks, splits and separations. MDF is considered to be more stable than real wood under humid or dry conditions. Neither product performs well under direct exposure to water, but MDF has the edge over wood under conditions of high or low humidity. The amount of shrinkage or expansion of MDF is a non-issue at moderate levels. Wood cabinets are traditional. With a complex array of grain patterns, color and depth, wood cabinets have the market cornered on old-fashioned beauty. Natural wood cabinets contain patterns that -- not unlike snowflakes -- are never repeated. If you're spending lots of time in the kitchen, the variety of flowing grain patterns can be refreshing. MDF has no grain and offers a flat, characterless appearance when stained or painted. If you like glassy and smooth, MDF might be what you're looking for. One of the most widely used designs in cabinetry, the solid-wood, raised-panel door is manufactured using five pieces of wood. It looks great but it's expensive and time-consuming to build. Separations can occur to the doors over time, especially in the presence of fluctuating humidity. Raised-panel MDF cabinet doors can be milled from a single piece of MDF. It's affordable and produces the effect of a raised-panel door without the issues associated with expansion or shrinking. MDF can be milled or carved into almost any shape with routers, saws or other woodworking equipment. MDF cabinets weigh more than real wood cabinets. The difference can be substantial if overhead cabinets are hung from rafters or soffits. In some instances, extra bracing should be used for MDF cabinets. Some MDF doors such as pantry doors, which can be full-length, require extra hinges to support the weight, as well as longer, bigger hinge screws. The flat, slick surface of MDF, even though not as interesting as real wood, can be advantageous when it comes to cleanup. Most MDF finishes can be wiped clean with a damp cloth. Commercial businesses -- such as hospitals, offices, clinics or anywhere efficiency is valued -- prize MDF for its utilitarian look and easy-to-clean properties. 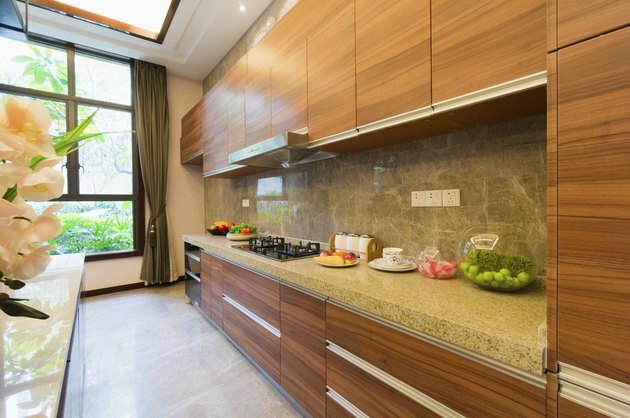 Wood cabinets, with a variety of clear finishes, should be cleaned more carefully, using products designed for wood. If dirt and grime has penetrated into grain patterns over time, they are more difficult to remove. Small dings, dents and scratches are easier to deal with on real wood cabinets. When damage occurs to MDF -- no matter how insignificant, the flat, even surface of MDF makes it hard to disguise. The repair job almost always looks like a repair job unless the panel or door is sanded and refinished in its entirety. Dents, gouges and scratches in real wood can be filled with matching wood crayon, stain markers or wood dough. If done with care, the repair job is almost invisible.